Really Reasonable Ribbon Blog: Celebrate! Hey there all you ribbon lovers! We are going to have a bit of a lesson in Cardmaking 101. grins! I'm here to show you how to use your purchases from Really Reasonable Ribbons to accent the designs on your cards. Don't ever feel that you have to use big fluffy bows every single time you make a card (although you most certainly CAN!). Sometimes it's fun to use the smaller things you can find in the store. You'll be surprised at how well they actually highlight your focal point, be it a stamped image or sentiment, or perhaps a vintage bit of clip art. On the card I am showing here today, the digital image of the boots and flowers is our focal point. The doily serves as a matting piece. I die cut the sentiment, but needed something to help draw the eye to it. That is where a little piece of the Judy crochet trim came in handy. Yes, I do save every little snippet of ribbon and trim! :) By stapling the piece directly under the sentiment, it draws attention in that direction. A vintage button adds a bit more interest. Next we go directly below the image to the piece of polka dot decorative paper. While the border punch helps add some fun and the scallops are similar to the other shapes on the card, the addition of the pink burlap string helps give a bit of grounding to the main image. It also adds a nice texture with the great fibers and bow. What I love about the Wild Orchid Crafts flowers is how easy they are to adapt to the colors of your project. The yellow of the Cottage Rose didn't quite match the papers, so I watercolored it a bit. I LOVE the way they take the inks! :) If you don't want to wait for it to dry naturally, just give it a quick hit with your heat gun. These and similar flowers can be found in the RRR store. 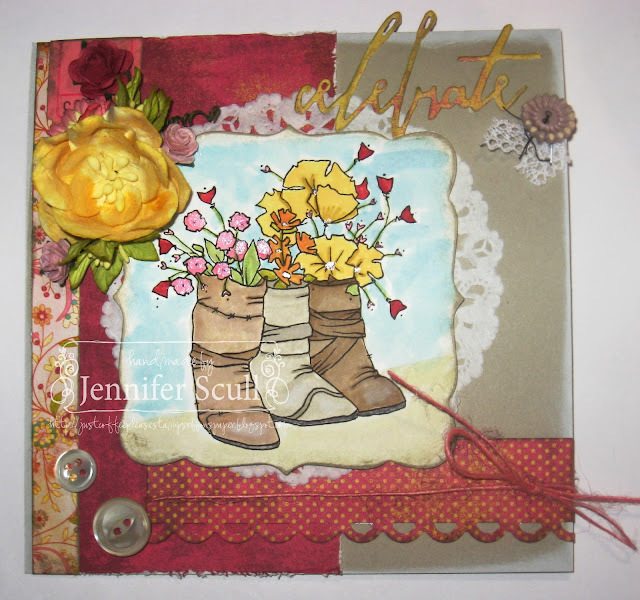 For more detailed information about my card, stop by my blog, "Just Coffee Please..."
Love the boots and beautiful card. Larry has some old boots wore out and might put flowers in them in the spring. Cute! RRR January Blog Hop Winner!